Join the discussion on our forums! Come discuss Prince Liam over in our dedicated Prince Liam discussion topic. "I have a very particular set of skills. Skills that make me a nightmare for witches like you." 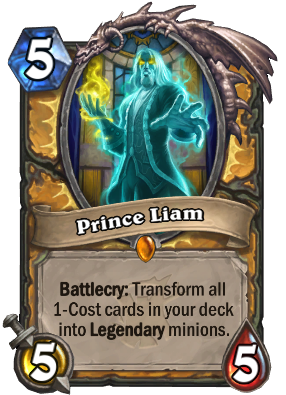 if Prince Liam is good why is he dead ? When you hover over a card like Renounce Darkness in the play history, it shows every card in your deck that was replaced. From what I've seen, Prince Liam doesn't do this. I don't see why it wouldn't and I think it should. It seems kind of inconsistent. Well.. maybe you shouldn't put 25 1-drops in a deck with minimal draw? In a very brief set of games where i played him, and the game turned to late turns, he was useless in 1 case, while he won me the game in 4 matches. You don't always need his effect, but it's good in a Midrange deck as a secondary wincondition. Was thinking the same, just in the Star Wars version. Unless it's a joke i don't get, this is the only legendary in this expansion with serious flavor text. Kinda lame, considering I like how badass Death Knights and Spellstones flavor texts are. It's a play on a popular line from the film Taken, starring Liam Neeson. Actually one of the funnier texts from this expansion IMO. This is a really good card! In the late game you really do not want to top deck a 1 mana minion. Liam just gives you pretty good minions instead of those 1 mana top decks that could be really bad for you. 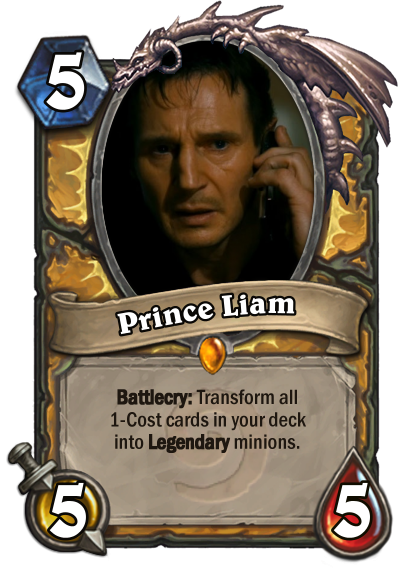 So unless you are using an aggro deck and rely on low cost minions Liam Gives you a higher chance of getting high cost minions with bigger impact later in the game. Finally! paladin can counterWeasel Tunneler priest!